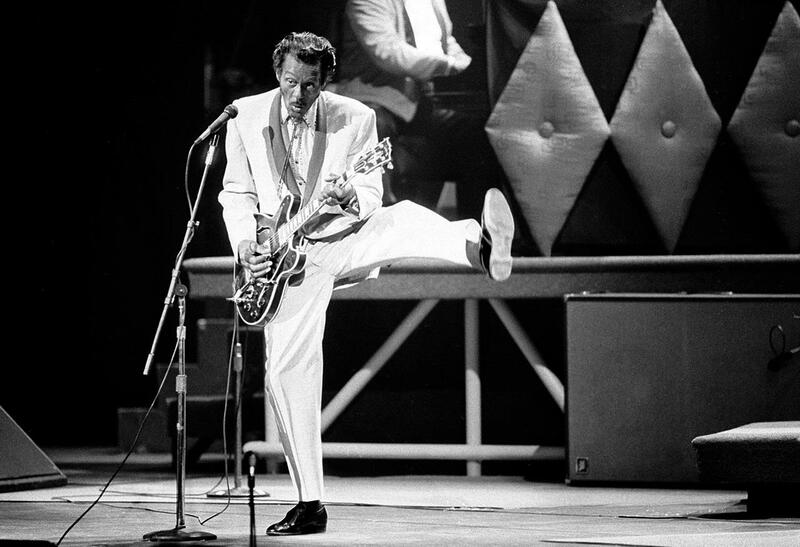 Chuck Berry, rock 'n' roll's founding guitar hero and storyteller who defined the music's joy and rebellion in such classics as "Johnny B. Goode," ''Sweet Little Sixteen" and "Roll Over Beethoven," died Saturday at his home west of St. Louis. He was 90. Emergency responders summoned to Berry's residence by his caretaker about 12:40 p.m. found him unresponsive, police in Missouri's St. Charles County said in a statement. Attempts to revive Berry failed, and he was pronounced dead shortly before 1:30 p.m., police said. 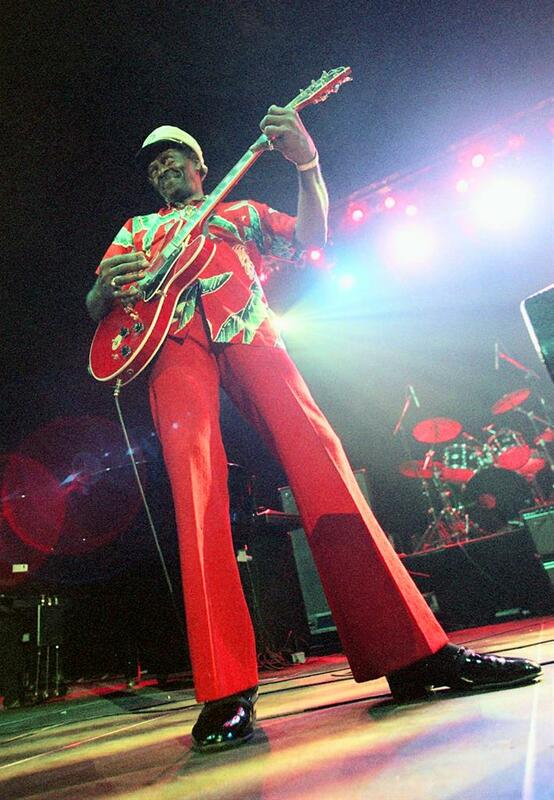 Berry's core repertoire was some three dozen songs, his influence incalculable, from the Beatles and the Rolling Stones to virtually any group from garage band to arena act that called itself rock 'n roll. "Just let me hear some of that rock 'n' roll music any old way you use it I am playing I'm talking about you. 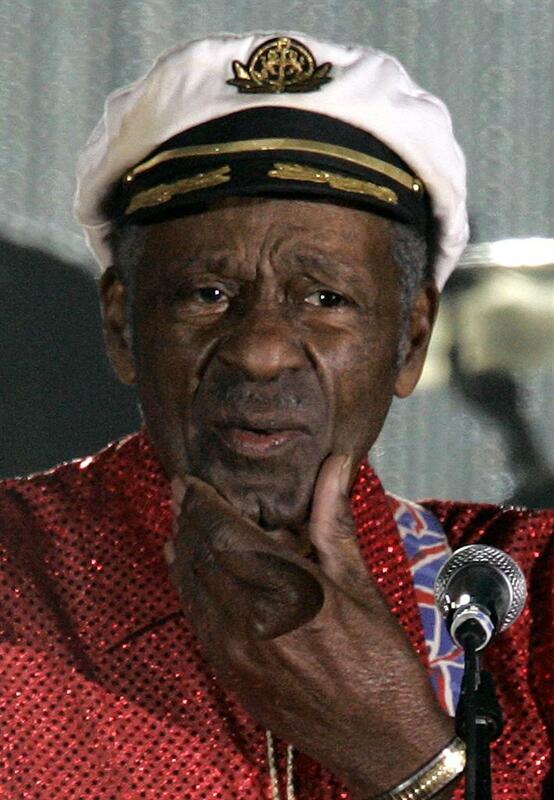 God bless Chuck Berry Chuck," Beatles drummer Ringo Starr tweeted, quoting some lyrics from a Berry hit. While Elvis Presley gave rock its libidinous, hip-shaking image, Berry was the auteur, setting the template for a new sound and way of life. 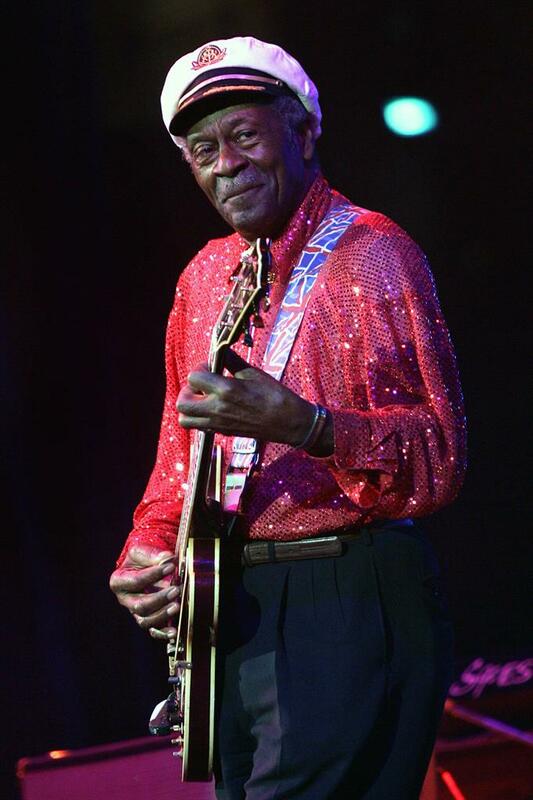 "Chuck Berry was a rock and roll original. A gifted guitar player, an amazing live performer, and a skilled songwriter whose music and lyrics captured the essence of 1950s teenage life," The Rock & Roll Hall of Fame said in a statement. Well before the rise of Bob Dylan, Berry wedded social commentary to the beat and rush of popular music. "He was singing good lyrics, and intelligent lyrics, in the '50s when people were singing, "Oh, baby, I love you so,'" John Lennon once observed. Berry, in his late 20s before his first major hit, crafted lyrics that spoke to the teenagers of the day and remained fresh decades later. "Sweet Little Sixteen" captured rock 'n' roll fandom, an early and innocent ode to the young girls later known as "groupies." ''School Day" told of the sing-song trials of the classroom ("American history and practical math; you're studying hard, hoping to pass...") and the liberation of rock 'n' roll once the day's final bell rang. "Roll Over Beethoven" was an anthem to rock's history-making power, while "Rock and Roll Music" was a guidebook for all bands that followed ("It's got a back beat, you can't lose it"). "Back in the U.S.A." was a black man's straight-faced tribute to his country at a time there was no guarantee Berry would be served at the drive-ins and corner cafes he was celebrating. "Everything I wrote about wasn't about me, but about the people listening," he once said. "Johnny B. Goode," the tale of a guitar-playing country boy whose mother tells him he'll be a star, was Berry's signature song, the archetypal narrative for would-be rockers and among the most ecstatic recordings in the music's history. Berry can hardly contain himself as the words hurry out ("Deep down Louisiana close to New Orleans/Way back up in the woods among the evergreens") and the downpour of guitar, drums and keyboards amplifies every call of "Go, Johnny Go!" The song was inspired in part by Johnnie Johnson, the boogie-woogie piano master who collaborated on many Berry hits, but the story could have easily been Berry's, Presley's or countless others'. Commercial calculation made the song universal: Berry had meant to call Johnny a "colored boy," but changed "colored" to "country," enabling not only radio play, but musicians of any color to imagine themselves as stars. "Chances are you have talent," Berry later wrote of the song. "But will the name and the light come to you? No! You have to go!" 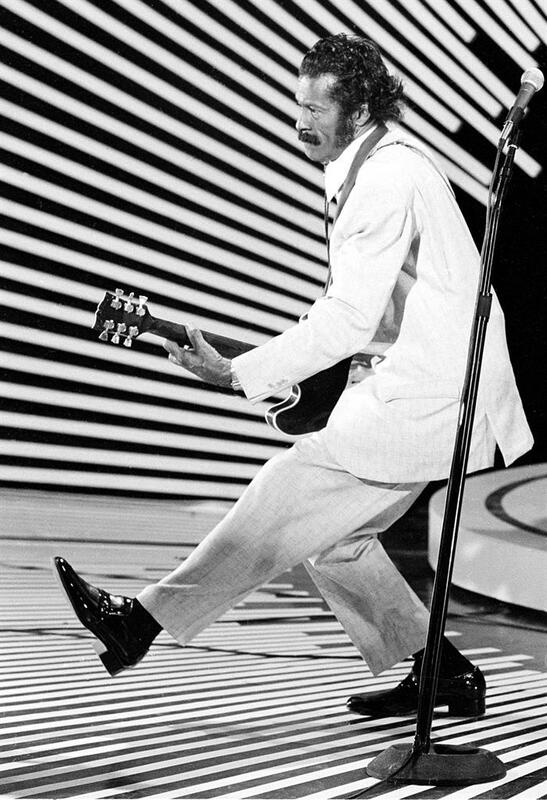 Johnny B. Goode could have only been a guitarist. The guitar was rock 'n' roll's signature instrument and Berry's clarion sound, a melting pot of country flash and rhythm 'n blues drive, turned on at least a generation of musicians, among them the Rolling Stones' Keith Richards, who once acknowledged he had "lifted every lick" from his hero; the Beatles' George Harrison; Bruce Springsteen; and the Who's Pete Townshend. When NASA launched the unmanned Voyager I in 1977, an album was stored on the craft that would explain music on Earth to extraterrestrials. The one rock song included was "Johnny B. Goode." Charles Edward Anderson Berry was born in St. Louis on Oct. 18, 1926. As a child he practiced a bent-leg stride that enabled him to slip under tables, a prelude to the duck walk of his adult years. His mother, like Johnny B. Goode's, told him he would make it, and make it big. A fan of blues, swing and boogie woogie, Berry studied the very mechanics of music and how it was transmitted. As a teenager, he loved to take radios apart and put them back together. Using a Nick Manoloff guitar chord book, he learned how to play the hits of the time. He was fascinated by chord progressions and rhythms, discovering that many songs borrowed heavily from the Gershwins' "I Got Rhythm." He began his musical career at age 15 when he went on stage at a high school review to do his own version of Jay McShann's "Confessin' the Blues." Berry would never forget the ovation he received. "Long did the encouragement of that performance assist me in programming my songs and even their delivery while performing," he wrote in his autobiography. "I added and deleted according to the audiences' response to different gestures, and chose songs to build an act that would constantly stimulate my audience." Meanwhile, his troubles with the law began, in 1944, when a joy riding trip to Kansas City turned into a crime spree involving armed robberies and car theft. Berry served three years of a 10-year sentence at a reformatory. A year after his October 1947 release, Berry met and married Themetta Suggs, who stayed by his side despite some of his well-publicized indiscretions. Berry then started sitting in with local bands. By 1950, he had graduated to a six-string electric guitar and was making his own crude recordings on a reel to reel machine. On New Year's Eve 1952 at The Cosmopolitan club in East St. Louis, Illinois, Johnson called Berry to fill in for an ailing saxophonist in his Sir John Trio. "He gave me a break" and his first commercial gig, for $4, Berry later recalled. "I was excited. My best turned into a mess. I stole the group from Johnnie." Influenced by bandleader Louis Jourdan, blues guitarist T-Bone Walker and jazz man Charlie Christian, but also hip to country music, novelty songs and the emerging teen audiences of the post-World War II era, Berry signed with Chicago's Chess Records in 1955. "Maybellene" reworked the country song "Ida Red" and rose into the top 10 of the national pop charts, a rare achievement for a black artist at that time. According to Berry, label owner Leonard Chess was taken by the novelty of a "hillbilly song sung by a black man," an inversion of Presley's covers of blues songs. Several hits followed, including "Roll Over Beethoven," ''School Day" and "Sweet Little Sixteen." Among his other songs: "Too Much Monkey Business," ''Nadine," ''No Particular Place To Go," ''Almost Grown" and the racy novelty number "My Ding-A-Ling," which topped the charts in 1972. Berry also appeared in a dozen movies, doing his distinctive bent-legged "duck-walk" in several teen exploitation flicks of the '50s. Richards organized the well-received 1987 documentary "Hail! Hail! Rock 'n' Roll," a concert at St. Louis' Fox Theatre to celebrate Berry's 60th birthday. It featured Eric Clapton, Little Richard and Jerry Lee Lewis, who recalled being told by his own mother that Berry, not he, was the true king of rock 'n' roll. Country, pop and rock artists have recorded Berry songs, including the Beatles ("Roll Over Beethoven"), Emmylou Harris ("You Never Can Tell"), Buck Owens ("Johnny B. Goode") and AC/DC ("School Days"). The Rolling Stones' first single was a cover of Berry's "Come On" and they went on to perform and record "Around and Around," ''Let it Rock" and others. Berry riffs pop up in countless songs, from the Stones' ravenous "Brown Sugar" to the Eagles' mellow country-rock ballad "Peaceful Easy Feeling." Some stars covered him too well. The Beach Boys borrowed the melody of "Sweet Little Sixteen" for their surf anthem "Surfin' U.S.A." without initially crediting Berry. The Beatles' "Come Together," written by John Lennon, was close enough to Berry's "You Can't Catch Me" to inspire a lawsuit by music publisher Morris Levy. In an out of court settlement, Lennon agreed to record "You Can't Catch Me" for his 1975 "Rock n' Roll" album. On his 90th birthday last year, Berry disclosed that he would release his first new album in 38 years in 2017, titled simply: "Chuck." The announcement said it would be comprised primarily of new, original songs written, recorded and produced by him. In 2000, Johnson sued Berry over royalties and credit he believed he was due for the songs they composed together over more than 20 years of collaboration. The lawsuit was dismissed two years later, but Richards was among those who believed Johnson had been cheated, writing in his memoir "Life" that Johnson set up the arrangements for Berry and was so essential to the music that many of Berry's songs were recorded in keys more suited for the piano. Openly money-minded, Berry was an entrepreneur with a St. Louis nightclub and, in a small town west of there, property he dubbed Berry Park, which included a home, guitar-shaped swimming pool, restaurant, cottages and concert venue. He declined to have a regular band and instead used local musicians, willing to work cheap. Springsteen was among those who had an early gig backing Berry. Burned by an industry that demanded a share of his songwriting credits, Berry was deeply suspicious of even his admirers, as anybody could tell from watching him give Richards the business in "Hail! Hail! Rock 'n' Roll." For the movie's concerts, he confounded Richards by playing songs in different keys and tempos than they had been in rehearsal. Richards would recall turning to his fellow musicians and shrugging, "Wing it, boys." Berry's career nearly ended decades earlier, when he was indicted for violating the Mann Act, which barred transportation of a minor across state lines for "immoral purposes." An all-white jury found him guilty in 1960, but the charges were vacated after the judge made racist comments. A trial in 1961 led to his serving 1 1/2 years of a three-year term. Berry continued to record after getting out, and his legacy was duly honored by the Beatles and the Stones, but his hit-making days were essentially over. "Down from stardom/then I fell/to this lowly prison cell," Berry wrote as his jail time began. Tax charges came in 1979, and another three-year prison sentence, all but 120 days of which was suspended. Some former female employees later sued him for allegedly videotaping them in the bathroom of his restaurant. The cases were settled in 1994, after Berry paid $1.3 million. "Every 15 years, in fact, it seems I make a big mistake," Berry acknowledged in his memoir. Still, echoing the lyrics of "Back in the U.S.A.," he said: "There's no other place I would rather live, including Africa, than America. I believe in the system." Tags: American, art, Berry, culture, entertainment, guitar, guitarist, Johnny B. Goode, music, musician, rock and roll, Rock music, Roll Over Beethoven, singer, song, songwriter, U.S.